Last month, I introduced a new series to you guys called 'Hip Mom, Smart Mom, Stylish Mom.' I explained that when I was pregnant, I thought a lot about what kind of changes would take place in me after the baby arrived, and if it would be difficult to maintain my individual identity and style. I knew that I absolutely wanted Essley to come first, without question - but I also knew that it was important to continue to stay true to who I was, and to continue to enjoy the things that made me ME, pre-baby. Well despite much less sleep and free time, a consistently messy home, and a wardrobe that is rarely wrinkle-free or truly clean, I can honestly say that I at least make a conscious effort to be somewhat stylish, to create a relatively healthy balance between work/family/life, and to remind myself that it's neither necessary nor appealing for me to fit into the mold of the stereotypical, traditional mom. I'm lucky to know (and constantly meet) other moms who feel the same way that I do. These women are committed mothers who defy convention. They are true to their kids and true to their families, but also true to themselves. These moms are hip, smart, and stylish - and I'm thrilled to be able to share, in their words, what makes them that way. For the second post in this series, I'm excited to feature two hip Atlanta-based mamas with whom I've established friendships as fellow bloggers over the past few years. The two of them have been best friends since college, and together run a fantastic company called Maiedae. Their babies are only a few months younger than Essley, and it's been fun to be able to share our pregnancies and now watch our little ones grow and go through milestone so close together. Welcome the hip, smart, and stylish Savannah Wallace (above left) and Jenny Highsmith (above right). Welcome Savannah and Jenny! Please introduce yourself to Bubby and Bean's readers. Hey guys! It's Jenny and Savannah from Maiedae here :) We are so excited to be a part of this new series with Melissa, thanks so much for having us! To begin with, we'll tell you a little bit about ourselves. We are best friends, business partners, and are both new mothers (Rowan - 3 months and Soren - 6 months). Our business, Maiedae, consists of a full-time blog that we run together, a print shop, a fancy mixer that we run annually in Atlanta, and a graphic design company that specializes in blog design. 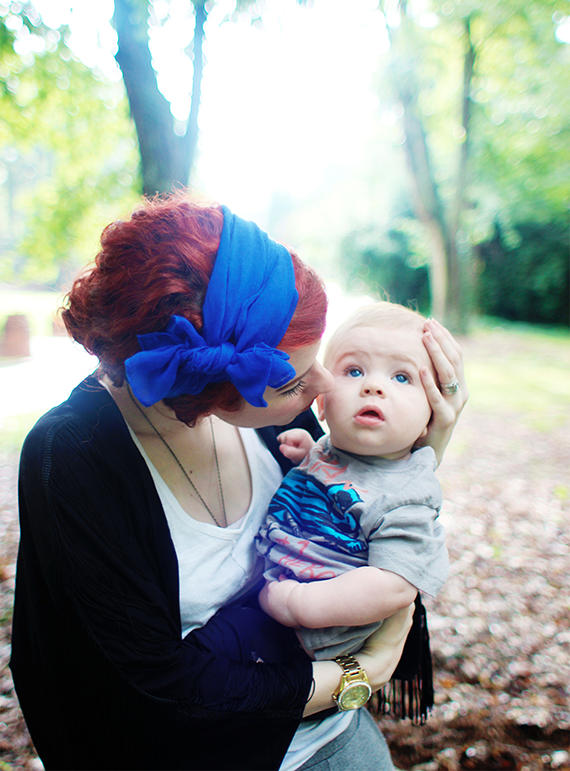 We love to share our adventures in motherhood, fashion, baby, home, beauty, wellness, and living a creative lifestyle! We both love to style outfits differently, but I'd say we both could describe our style as: simple, feminine, comfortable and fun. (That's four, but close enough :)). 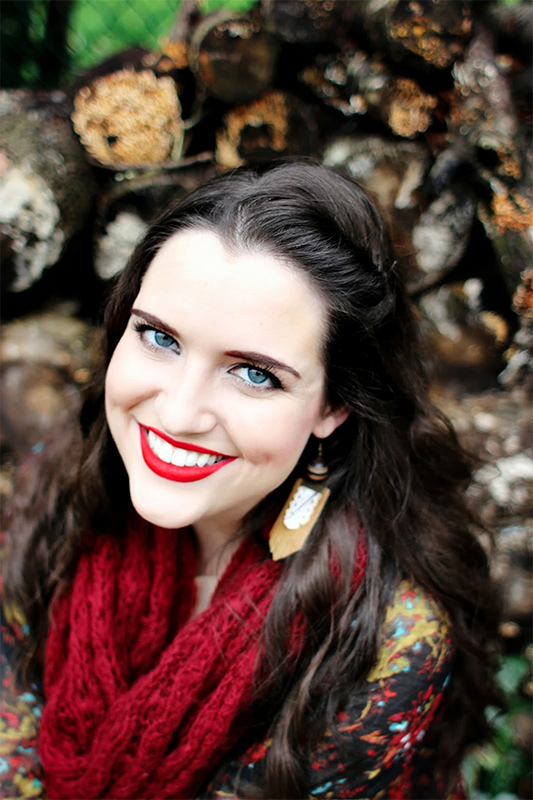 We love finding basic outfits and adding a little bit of "glam" - like a cute head scarf, a fun patterned kimono, or a beautiful piece of jewelry. Jenny tends to be more classy and artistic with a boho vibe, and Savannah is more edgy and neutral, but with a dash of boho too. We will ALWAYS pick comfort over anything, especially now that we are keeping up with our new little ones! A lot of days we're lucky if we get a shower, so some comfy leggings (like these from Seamly Co.) and a flowy tank top or loose shirt are perfect for wearing around the house, running out to do quick errands, and nursing our babes. We both work from home so we are not ashamed to rock the lounge look most of the week. If we have a meeting or an outing planned we try to dress it up a little more, but we love finding transitional pieces that work at home and professionally. What do you wear when you go out with your husbands or girlfriends? Are your outfits different or the same as when you're hanging with the kids? Several times a week, we both try and get a little more dressed up - whether it's for date night with our husbands or to hang out over coffee with a girlfriend. 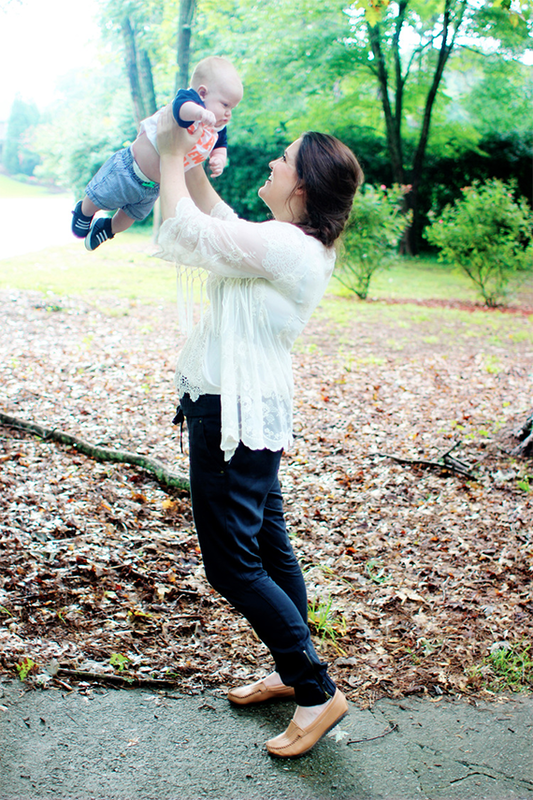 In those cases, we both love wearing some comfy: worn-in skinny jeans, a cute pair of patterned flats, and lots of flowy layers (which is a great way to hide that postpartum tummy). If we want to be really fancy, we'll throw on dresses, but that's usually only for special occasions - aka it's really hard to nurse in a dress so that only happens on date nights. We love a good pair of jeans (usually from Gap or Urban Outfitters), a beautiful, flowy cardigan or kimono, and a comfortable pair of shoes we could wear around all day that also look awesome. We both have huge crushes on Minnetonka. 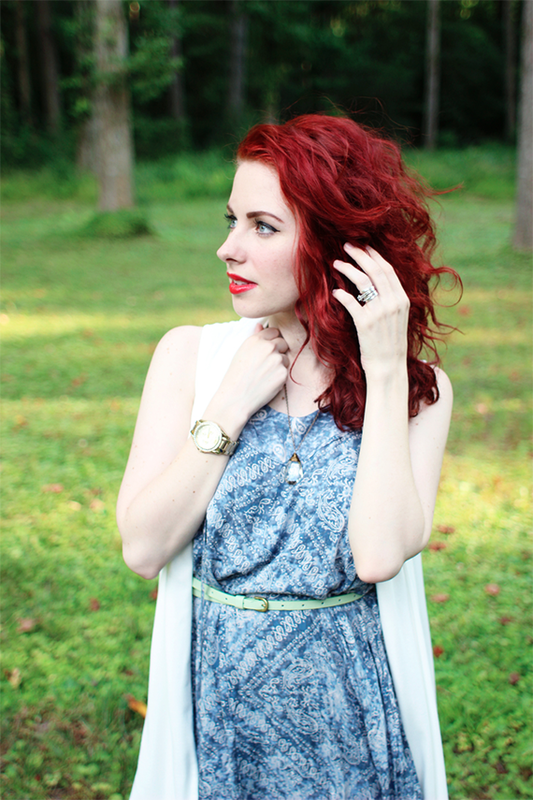 Target and Forever21 always have great finds at an inexpensive price. However, we’ve really been focusing on investing in our wardrobe and obtaining quality over quantity. 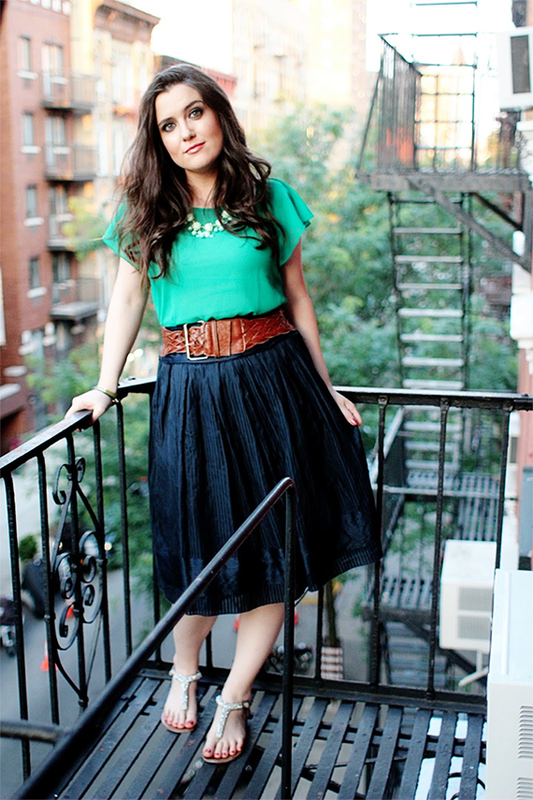 We’ve been loving Seamly Co., Anthropologie, Madewell, and Gap. Some of our favorite places to shop for baby clothes are: babyGap, Target, Carter's, and Little Hip Squeaks. Carter's always have the BEST sales and way cute stuff. We can't get enough of their baby PJs. Balance is such an unattainable word but something we are always working towards even if we never, ever reach it. More often than not we don’t spend enough “me” time and find ourselves in desperate need of showers and brushes through our hair. We let ourselves be ok with that and just dive into motherhood head-first. However, we’ve found that it’s really important to at least try to carve out time for ourselves, dress-up, put on some make-up and take that time to feel like ourselves. It’s easy to loose a sense of identity when becoming a mom. You are a soother, source of food, diaper changer, cozy cuddle, fierce protector, wiper of gross things... you are mother. It’s a beautiful thing, but we need to be affirmed and reminded that we are also still ourselves AND beautiful. So while we don’t do this everyday, we do try to make it a priority at least a few times each week. 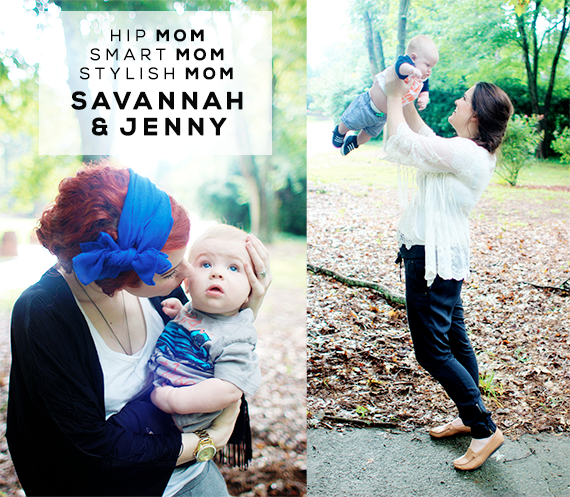 Thanks again to the wonderful Savannah and Jenny for being our second hip/smart/stylish moms! Don't forget to pay them a visit over at Maiedae. You can also find them on Instagram (Jenny/Savannah), Pinterest (Jenny/Savannah), and Youtube. Savannah and Jenny are so cute! I'm also envious of their superior makeup skills, because half the time I still don't know what I'm doing. Haha. How sweet that their boys are so close in age! I love Carter's too and agree that they have the best sales!! I also have to say that I love Savannah's hair!! No "Mom Jeans" here :) These two are so cute...I envy their sense of style! 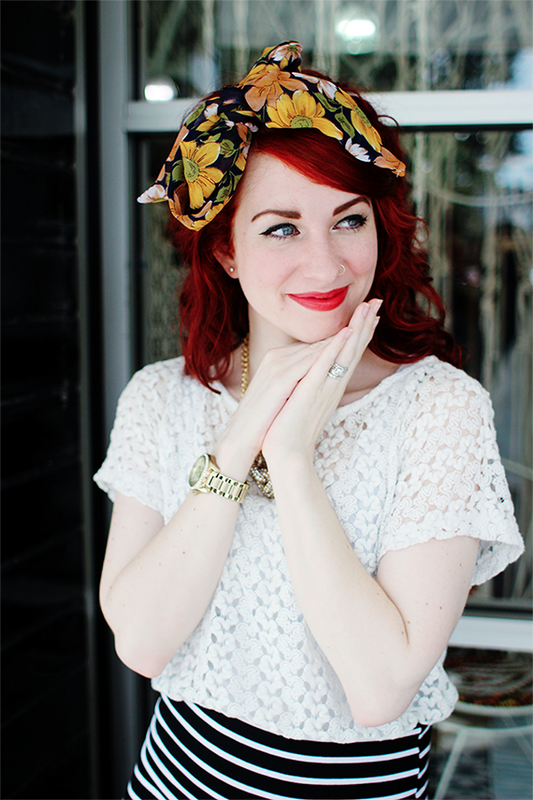 Savannahs head scarves are soooo cute! Savannah and Jenny also look gorgeous! Seriously inspiring, so fun to read their tips and tricks! Such a lovely feature, with sweet pics:) Also inspiring! I'm in love with this post! Jenny and Savannah seem like amazing people! Its pretty awesome that they live so close to me. I'm literally only 30 minutes away from Atlanta. I had been starting to think that there were no successful, hip bloggers near me. I have been proved wrong! I will definitely go check out their blog ASAP!